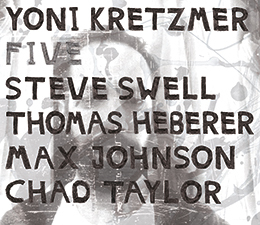 I was hooked by Yoni Kretzmer's new quintet from the start. First hearing the group in concert an Arts for Arts event last April, then at a show in the tight subterranean headquarters of the Downtown Music Gallery, and finally on their debut recording, Five, to my ears, is the clearest example of saxophonist and OutNow label head Kretzmer's musical vision - and with a repertoire that includes his brilliant 2Bass Quartet and collaborations with drummer Andrew Drury, that's a lot to top! This is an album brimming, teeming, overflowing, with life. 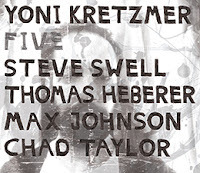 It follows some solid free-jazz best practices, too, like giving the listener strong melodic passages and transient musical structures to grasp while spinning ever further out solos and group improvisations. The band is Kretzmer on tenor sax, Thomas Heberer on trumpet, Steve Swell on trombone, Max Johnson on bass, and Chad Taylor on drums. Honestly, that line-up alone should have you frantically clicking the 'buy' button, but if that's not enough, the music is damn good too. The opener 'July 19' begins on the Ayler/late-period Coltrane side of the aisle, with an anthemic theme delivered by sax, complimented by the trumpet and trombone. Over the course of the track, the 'composed' quickly becomes undone and the melodic statements from each horn - as well as the drums, as Taylor is hardly playing in the background - engage in parallel play that at times relate and other times conflict with each other. The outcome is a slow burner held together by ever changing improvised melodies. The following 'Quintet I' is 13 minutes of musical bliss. Approximately half-way through the track, Kretzmer plays over a horn arrangement that smartly blends accessible melodies and riffs with the virtuosic soloing. Bookending him is Heberer and Swell who know how to walk a line between playing inside and outside. The energy bristles off each of these musicians. Skipping ahead to the closing tracks, 'Feb 23', starts with a solo Kretzmer, supported by the confidently swinging bass playing of Johnson, whose buoyant lines are a just a tiny bit ahead of the pulse, adding an extra bit of energy. As the trumpet and trombone color the outside, the saxophone's lines add more depth to the already vibrant melodic ideas. Swell and Heberer engage in an intriguing tandem solo about a third of the way through that is one of the great achievements of the album. Each dig deep and deliver sympathetic and stunning solos. The final 'For Dc' begins with wooden flutes - never my favorite thing, but nonetheless, a change in the tonality. The group improv that rises from this ebbs and flows until a slow and grand ending that closes the album. Paul, I agree this is a great album. It reminds me of an adventurous mid-60s Blue Note album from someone like Jackie McLean.